With our rich expertise, we are offering a precision engineered range of Chill Roll Unit with Flaker that is manufactured using latest production technologies to make it in compliance with industry standards. In these units, the rolling speed and conveying speed of each mono-machine is controlled separately, so that it can be conveniently and easily operated. Further, these are also provided with an effective cooling system with low power load that help the units to function precisely. Chill Roll Unit with Flaker help in squeezing the Extrudate material into a thin continuous band. The cooled extrudate is passed through flaker reducing the material to small sized chips suitable for feeding the fine Grinding Machine. The Squeeze Roller in the unit is made using quality raw material and can be easily cleaned. 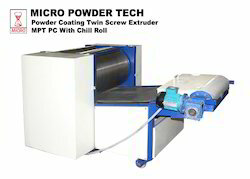 Looking for Powder Coating Chill Roll Unit With Flaker Plant ?